ALONZO is a 17-year-old youth with a condition called Cretinism, which he was born with because his mother lacked foods with enough iodine during pregnancy. Alonzo is developmentally delayed and small for his age. He speaks only a few words. He frowns a lot. To nearly every request he snaps "No!" Physically, he is strong and should have been able to walk, but he did not. To move him, his mother half-carried and half-dragged him. When she tried to help him stand or walk, he would sink to his knees. The PROJIMO team invited Alonzo and his mother to stay at the center for a few days, to help him start walking. But Alonzo refused to cooperate. His mother did her best to stand him at the parallel bars, but he stubbornly resisted. Inez, who helps with physical therapy, had an idea. He asked Carlitos to help teach Alonzo. Carlos (who, like Alonzo, had resisted beginning to walk when first at PROJIMO) loved the idea. 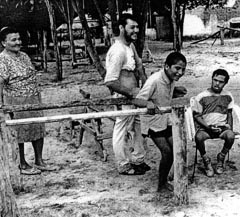 Carlos started by demonstrating how he could walk between the bars. "Look!" he cried. "Carlos can walk. So can you!" Alonzo watched with wonder. By the second day, Alonzo was more confident and willing to walk at the bars. His mother wanted him to try a walker. Inez chose a big blue wooden walker with front wheels. At first Alonzo refused. So Carlos paraded back and forth on his own walker. Alonzo decided to try. But a problem arose. Alonzo would push his walker and take small steps. But his feet did not keep up with his body. He leaned farther and farther forward until he almost fell. His frightened mother would jump to catch him. 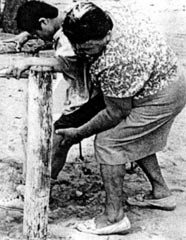 After a few near-falls, Alonzo and his mother grew discouraged. Suddenly Alonzo, scowling, pointed at Carlos who was parading back and forth on his long wooden walker-with-a-seat. 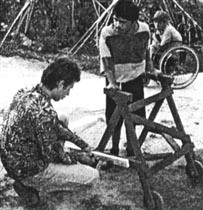 Carlos willingly moved to his wheelchair. Inez helped Alonzo step into his friend's walker. Without prompting, Alonzo began to walk. As before, he started to lean forward precariously. But before he fell, his legs bumped into the seat behind him, acting like a brake. With this braking action, Alonzo felt safer. 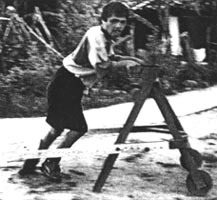 By evening he was running all around the playground, his nervous mother close on his heels. Bruised stripes formed on the back of his calves from the many bumps against the seat edge. But Alonzo was so excited about his new skill that he did not mind. Building on Alonzo's discovery, the next day Polo modified the big blue walker. 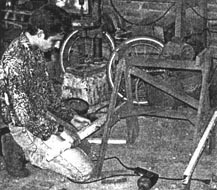 He attached some adjustable side-bars that extended backward to support a padded cross-bar, to function as a leg-brake. On testing, the new leg-brake worked fairly well. But Alonzo still leaned forward a lot. His mother still hovered over him, fearing he would fall. So Polo adjusted the rear brake-bar closer to the walker. Now, with less leg room, it stopped Alonzo from leaning forward as much. He could walk more upright, and with greater control. At last his mother was willing to stand back and let him walk alone. 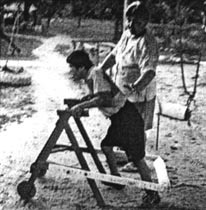 To help Alonzo improve his balance so that eventually he could walk without any assistive device, the PROJIMO team suggested that his mother encourage him to walk while holding onto a rope stretched between two trees. The rope, being less stable than parallel bars or a walker, requires more balance. Rope walking can therefore be another step toward independent walking. 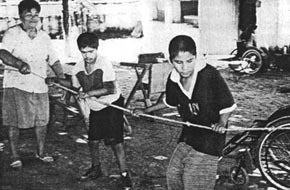 At first the rope can be stretched tight, then gradually loosened as the child's balance and control increase. 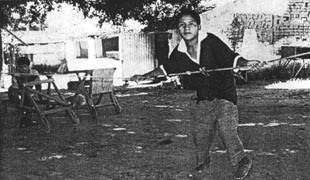 As with the parallel bars and the walker, at first Alonzo was afraid to try to stand or walk holding the rope. Once again, Carlos came to the rescue. He walked back and forth holding the rope while Alonzo sat watching him. At last Alonzo was willing to try. First he hung fearfully onto the rope without moving. Then Carlos coaxed him into a "follow the leader" game, back and forth along the rope. In the end, they both had a good time. In 4 days at PROJIMO Alonzo made great progress learning to walk - and with trying new things. His mother learned to be less over-protective and to let Alonzo do more on his own, even if it meant taking some risks. 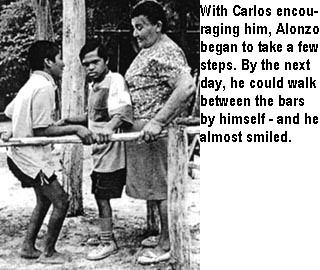 For Carlos, being asked to assist another child with problems similar to his own was a marvelous experience. He took joy and pride in helping. Folks at PROJIMO remembered how unreachable Carlos had been when he first came, and realized how far he had come. Like many of us, Carlos discovered that one of the greatest joys in life comes from reaching out to others in need. 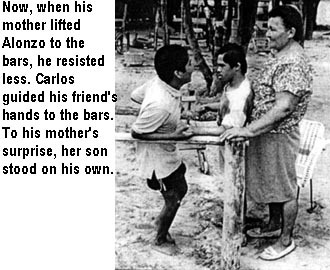 For more about Carlos, see Chapter 34.